Heat oven to 400°F. In small bowl, combine oil, basil, oregano, salt, garlic powder and pepper; mix well. In ungreased 13x9-inch (3-quart) baking dish, arrange mushrooms, tomatoes and onions; brush with about half of oil mixture. Arrange chicken over vegetables. Brush with remaining oil mixture. Bake at 400°F. 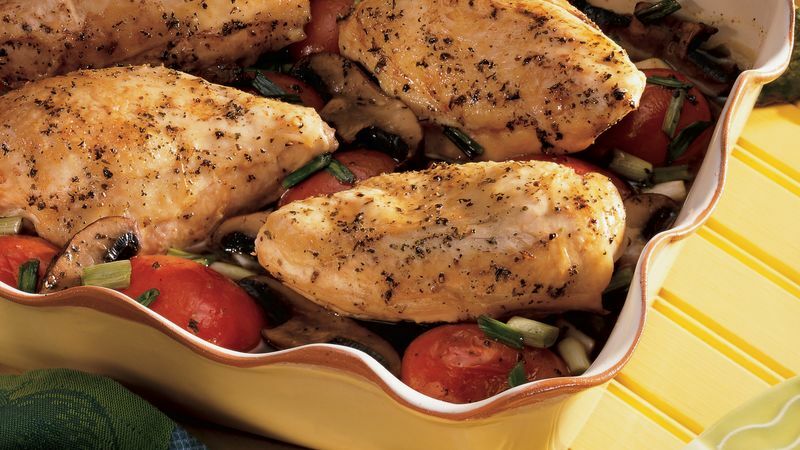 for 50 to 60 minutes or until chicken is fork-tender and juices run clear, spooning pan juices over chicken once during baking. Serve chicken and vegetables with pan juices. Portobello mushrooms are the mature form of small brown cremini mushrooms. These giant mushrooms are very meaty and earthy-flavored. Whole, sliced and quartered portobellos are available in the produce department. The stems from portobello mushrooms are woody and should be discarded. Use a mushroom brush to clean portobellos. Small soft brushes for this purpose are available in cookware stores. Rice pilaf is a good accompaniment to this Italian-style chicken dish.